Review New Windows client, new Windows server seems to be the pattern; and October 18, 2013 saw the release of Windows Server 2012 R2 as well as Windows 8.1. The R2 release is a paid-for upgrade, but uses the same CALs (Client Access Licenses) as Server 2012, mitigating the cost of transition. Microsoft calls Server 2012 a Cloud OS, by which it means an operating system optimized to run private, public or hybrid clouds, where “hybrid” means some servers on your own premises or data centre, and some in Microsoft’s public cloud, called Azure. The further implication is that Microsoft has concentrated its efforts on virtualisation, meaning not only the Hyper-V hypervisor, but also software-defined networking that abstracts virtual networks from physical networks, and virtualised storage that abstracts virtual drives from physical disks. Another strong focus is automation, driven by PowerShell support throughout the product, on top of which come management tools such as System Center’s Virtual Machine Manager and Orchestrator, and Azure’s browser-based portal. Abstraction and automation reduces the number of people who have to wrestle with the details of Windows Server – the things that give system administrators headaches, such as DCOM activation errors, Service Principal Names, mysterious errors in the event log, certificate permissions, the labyrinthine Windows security model, group policy errors and the like. These issues are no less likely in Server 2012 R2 than in previous versions, as I discovered when setting up one of the new features, Workplace Join that registers mobile devices in Active Directory, on my own test network. “An attempt to fetch the password of a group managed service account failed,” declared my event log, along with other problems that took me some time to resolve. Now compare that to the experience of logging into the Azure portal, selecting a web app from the gallery, and clicking through the wizard. It is delightful by comparison; and the more operations that can be moved to selecting from templates, galleries and scripts, the more users will enjoy using Windows Server. Virtualisation also increases the likelihood that you can solve a problem by zapping an instance and creating a new one, rather than trying to fix it. Microsoft’s push towards automation and self-service portals is the right direction, though someone still has to deal with low-level configuration. System Center 2012 R2 is a simultaneous release and is a key part of Microsoft’s overall server story. The Windows Azure Pack, also new, optionally brings the excellent Azure portal for cloud management and deployment to System Center; it is an awkward transition for existing System Center deployments but an improved experience for users and brings much-needed consistency between Azure and on-premises tools. 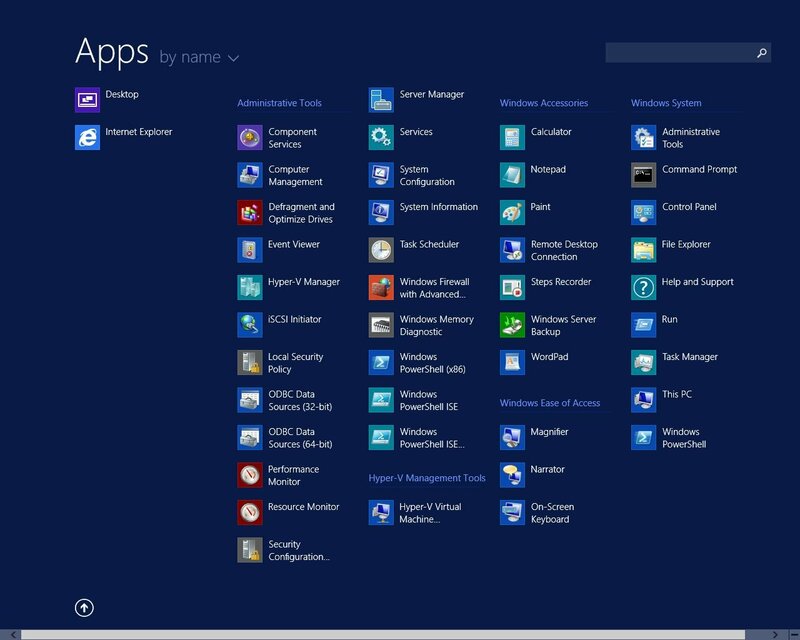 The list of what’s new in Server 2012 R2 is extensive. Of course it also has the Windows 8.1 Start menu changes. Hit the new Start button and you are offered just a few tiles, with a down arrow that takes you to a more complete list of built-in applications, with a right-click option to “Pin to Start”. In practice, most admins will simply stay in the desktop environment, or use remote access. The Server Manager has a handy Tools menu that lists administrative utilities, though it is little changed from the 2012 version. You configure Windows Server by adding roles and features, where a role is a major piece like Active Directory or Web Server, and a feature a lesser piece like Bitlocker drive encryption or Message Queuing. It is sometimes a struggle to remember whether a certain thing is a role, a feature, or a feature of a role; but you can usually find what you want. The Hyper-V question is not so much whether it has caught up with VMware, but whether it is good enough that the advantages of being built into Windows and integrating smoothly with System Center and the Windows client outweigh any advantages of a third-party hypervisor. That moment came with Windows Server 2012. Hyper-V was a solid hypervisor from its first release, and the 2012 edition brought features like Hyper-V Replica, which adds resilience by replicating a VM on another server at predefined intervals, commoditising what was once an enterprise-level feature. Another key feature is dynamic memory, allowing the system to vary the available RAM in a VM on demand. R2 is a modest update by comparison, but Replica is enhanced with configurable replication intervals, down to 30 seconds, and can be extended to three VMs, for example one locally and one remote. There is also support for live resize of virtual hard drives, faster live migration of VMs between hosts thanks to new data transfer options, and live export of a VM. If you have a problem with a production machine, you can do a live export and test various solutions in a lab environment, minimising downtime. Another new feature is shared virtual drives, provided they are in the latest VHDX format and located on a Cluster Shared Volume or Scale Out File Server, enabling failover clustering in VMs.